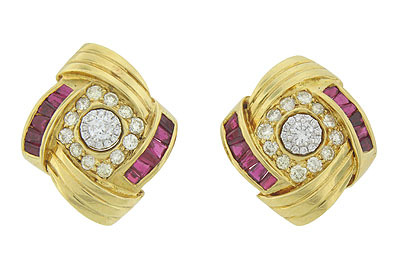 Ribbons of 18K yellow gold surround a frame of dazzling round cut diamonds on these elegant earring brackets. 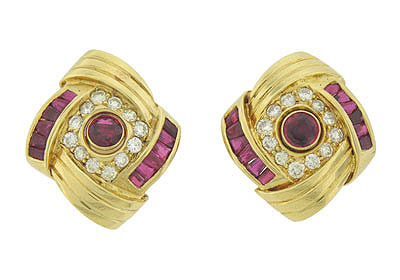 Square cut rubies curve around each side of the earrings, while single round cut rubies slip into the center of the golden brackets. 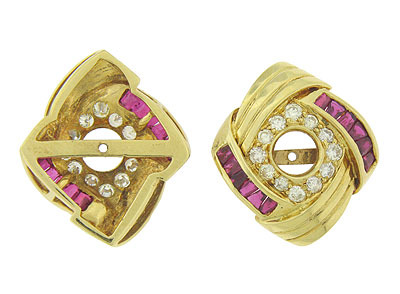 The handsome estate earrings are able to bracket additional round post earrings. Shown here with ER925 (sold separately). The earrings measure 1" square. Circa: 1950.